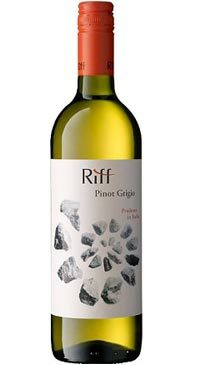 Riff (German for reef) created by one of northern Italy’s most famous producers, Alois Lageder. The Riff label’s graphic design is a direct reference to the influence these ancient limestone fossils have on the wine’s character and style. Vivacious and fresh showing aromas of green apple, melon and a hint of mountain wildflowers. Quite elegant on the palate-it offers a succession of taste impressions starting with fresh, spicy fruit followed by a creamy midpalate and a crisp, dry, mineral-laden finish.